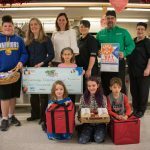 CAMBRIDGE, Vt. — Cambridge Elementary School has won a $4,000 grant as part of the Fuel Up to Play 60 program. The award was presented by the New England Dairy and Food Council, in conjunction with the National Football League. Fuel Up to Play 60 promotes in-school nutrition and physical activity at schools across the country by encouraging students to eat nutrient-rich food and exercise at least 60 minutes per day. Part of the money Cambridge Elementary won will go toward buying exercise equipment for in the classroom — including yoga balls.